Images communicate, powerfully. Spencer Burkes, in Making Sense of Church, suggests we are in need of metaphorical shifts in our understanding of â? ?Church.â? For example, in his chapter on ministry Burke notes the need to shift from â? ?Consumerâ? to â? ?Steward.â? So entrenched in consumer culture, the church needs a metaphor that helps deconstruct its uneasy relationship with dominant culture, reconstitute around its role in the â? ?missio deiâ?, and re-orient Jesus followers outward. 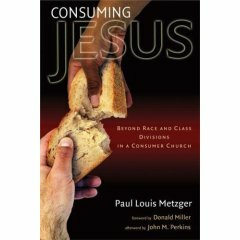 Paul Metzger utilizes image to challenge those in the church, its leaders and participants alike, to explore the ways consumer church linked inexorably to consumer culture fails to address issues of race and class. In the Introduction Metzger suggests trading coffee bars with stone altars. The image draws from C.S. Lewisâ? ?s Chronicles of Narnia where Aslan takes his place on the stone altar for another. The only purpose of the gospel is to reconcile people to God and to each other. A gospel that doesnâ? ?t reconcile is not a Christian gospel at all. But in America it seems as if we donâ??tâ?? believe that. We donâ??tâ?? really believe that the proof of our discipleship is that we love one another (see John 13:35). No, we think the proof is in numbers â?? church attendance, decision cards. Even if our â? ?convertsâ? continue to hate each other, even if they will not worship with their brothers and sisters in Christ, we point to their â? ?conversionâ? as evidence of the gospelâ? ?s success. We have substituted a gospel of church growth for a gospel of reconciliation. Coming of age in ministry during the heyday of the â? ?Church Growth Movement,â? Metzgerâ? ?s Introduction spurred me to read further.